Our first stop had to be at Rumbi's and like always every bite was savored. It truly is one place Sky and I could never get sick of. We are happy to say that we made it there 3x all different locations during our trip. Next it was off to TEMPLE SQUARE to see the lights and show the girls the temple! We didn't get to spend as much time as we wanted to in Salt Lake but in the 24 hrs we had we also crammed in 1 night with Nicole and Dave, visiting with extended family after Sky's cousins wedding, lunch with the Francis family and some good time with Great Grandpa where the girls got to be the receiver of one of Sky's childhood traditions the "candy horses" from Great Grandpa Gleave. Then it was off to Logan trying to beat another little snow storm. 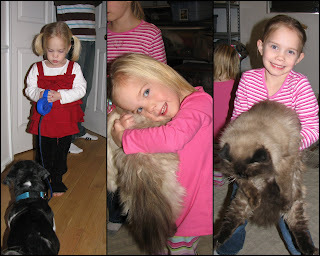 Once in Logan the girls were off with Nana to cake care of the cats and Bovi. Lexi got so into it and was often heard saying, "Come on Bovi" as she would walk him around the house on his leash or was found laying on top of him just like Ky did back in the day. Every time we came home from an activity the first phrase out of Lexi's mouth was normally "where's Bovi?" as she darted around the house finding him..."There he is" and soon after, "come on Nana, I see the cats!" 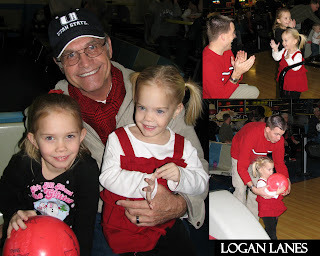 Ky was right there with her but found more entertainment living in Uncle Ry Ry's & Daddy's childhood memories. The 3 of them got quite a kick out of breaking out the old "Thing Maker", playing with old dinosaurs and even Spinjas as they had several tournaments together. The girls were also very excited to meet their first cousin on the Alsop side and Kylee was dying to hold little Mason. We made a trip over to Aunt Jenny and Uncle Tommy's the first day to see that beautiful boy and Ky impressed everyone with her great baby holding skills. We were so glad that we got to be there for his blessing as well. The girls eagerly awaited Christmas morning and had a great time making cookies for Santa with Nana. Christmas was a blast as there is nothing better than seeing the facial expressions kids have as they open up what is the coolest thing on earth over and over!!!!! Santa, Nana, Papa Ted, G-ma & G-pa and Mom & Dad definitely came through during the holiday season and the girls as always were spoiled rotten. A definite highlight was the fart machine that we gave to uncle Ry Ry. 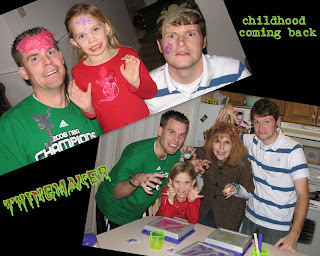 We all couldn't stop laughing and the bottom right picture is Lexi chiming right in! 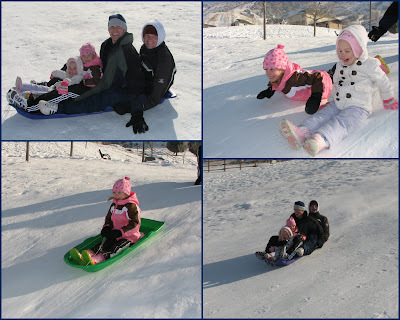 We had a great time at Papa Ted's on X-mas Eve and Christmas Afternoon. 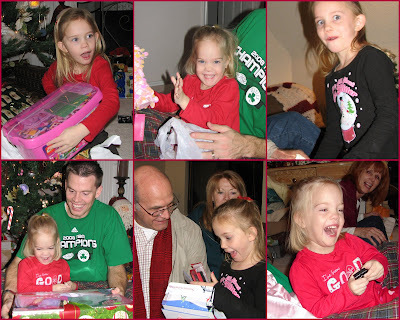 The girls were very entertained by all their perfect gifts. 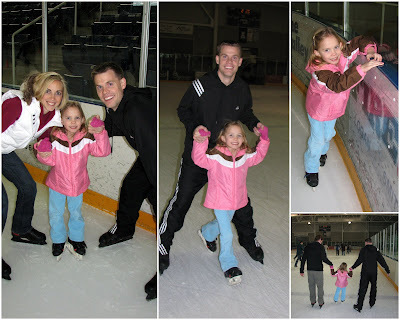 other events included: Ky's first Ice Skating experience, visiting with Gutke's, Temple, eating out, playing games with the family and a great round of sledding. Bowling like always but Lexi's first time really getting into it. We ended the trip with a few days up at Aunt Laura's and Uncle Taylor's where we tried to enjoy our first snowmobiling experience despite the foggy conditions and getting stuck one too many times. Kylee was quite the trooper getting all bundled up and Sky and I are ready for another try but not anytime in the near future. We loved warming up in the pool which is always a highlight! This trip, we had a fascinating tour of the potato plant and stood on top the biggest mound of potatoes we will ever see. We continue to be amazed at the entertainment Aunt Laura and Uncle Taylor provide for us in RUPERT, Idaho. Don't worry we will always keep coming back. 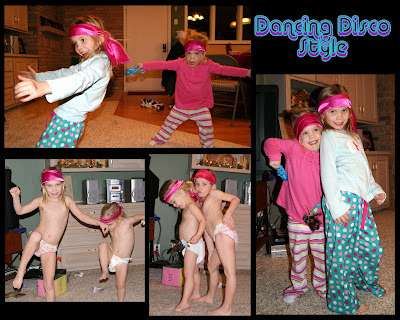 The girls kept us entertained in the evening with their dance parties and pink silky scarfs Laura made them that ended up being the perfect headbands. I love watching Peyton stare at my crazy girls. 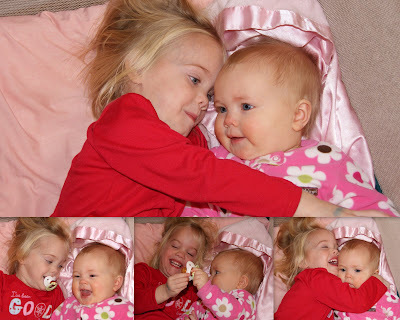 Lexi had a great time when Peyton got in the pack n play with her and began pulling her Binky out of her mouth. I'm sure Peyton was thinking, "Why does she have one of these...aren't they for babies." Yes, that is right my 2 1/2 yr. old just recently decided to become obsessed with her Binky or as she calls it a pinkie when she goes to sleep. I know...I need to break this habit fast!!!! Our last night we got to bring in the New Year with old college friends at Amber and Dan's house who put us up for the night. We are always amazed at no matter how much time passes you can easily pick up where you left off. We learned some great new games that we can't wait to share. All in all it was an amazing trip and we are thankful we got to spend the holiday with family and friends. We made it home to still have our own mini Christmas at home before heading back to school. The girls spent the day playing littlest pet shop and school with their gifts from g-ma & g-pa. They hung out in their new robes and enjoyed the shake 'n' go speedway from Santa as well. Looks like a fabulous trip - I'm not sure if you could have packed any more in! I love the picture with the girls' great Grandpa - what a treasure. It really looks like every moment was a blast and so fun to be surrounded by family. Plus, I want to hear more about this "thingmaker!" So glad you had a great trip and wonderful holidays after all the travel snafus! Way to pull it all off. I didn't know you went skating too. That's so fun! I love the girls faces that you captured during Christmas and their darling hair for the baby blessing. Way to go! I am sure glad I don't have to be jealous of that trip since I was a part of it! But, I miss you all already and seeing the pictures makes me want to relive having you here again. You got awesome facial expression pictures!!! It looks like you had a lot of fun! Those little babies are really cute. And I still can't get over how big your girls look to me! Miss you!!!!! !